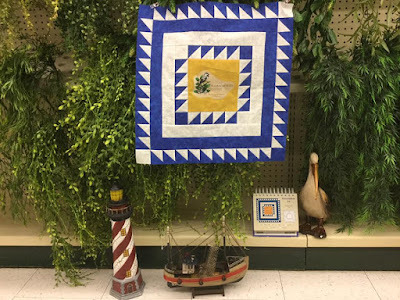 I love to sew. I don't always have a goal in mind. If I can piece and sew random blocks or paper pieced units, it doesn't bother me at all if they don't become a quilt right away. 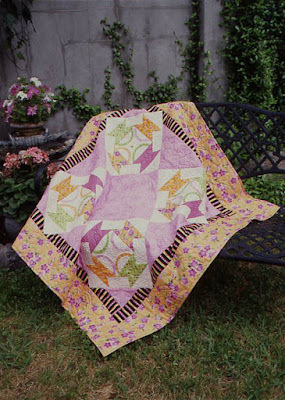 I've been known to let 5, 10 and even 15 years pass between when I started a quilt and when I finished it. Today I want to share a few random, disconnected blocks that I've been working on. Just to show you that we designers don't always work with deadlines! First, a few blocks made using Katja Marek's Hexagon Calendar as my inspiration. 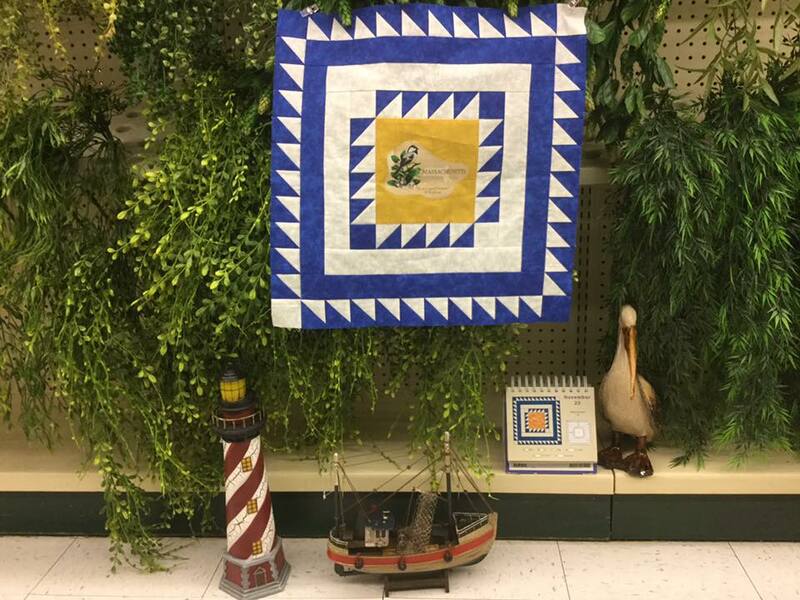 All of the blocks are designed for English Paper Piecing. 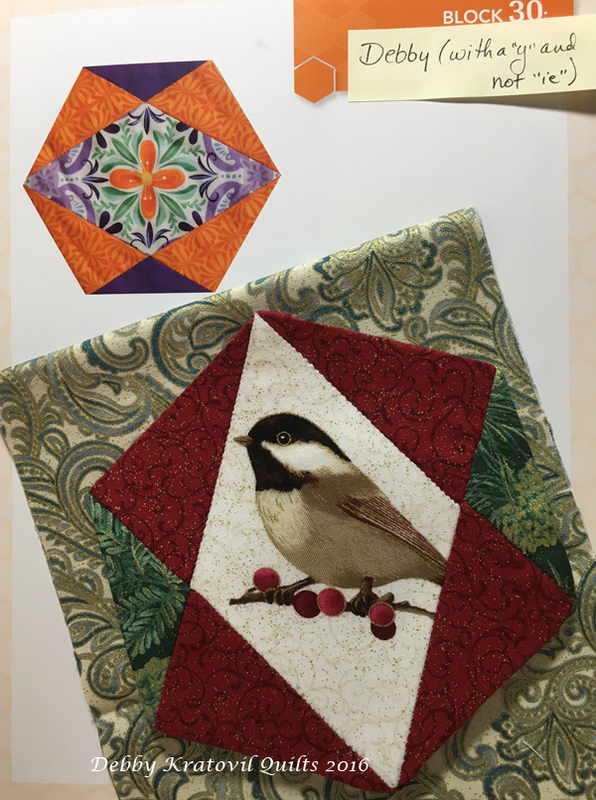 I have made many using EPP, but some of them can be rotary cut and I go with that, too! Take a visit to Katja's Quilt Shop in Canada (well, visit it online!) She is a very talented lady with so many wonderful samples from her books and calendar. 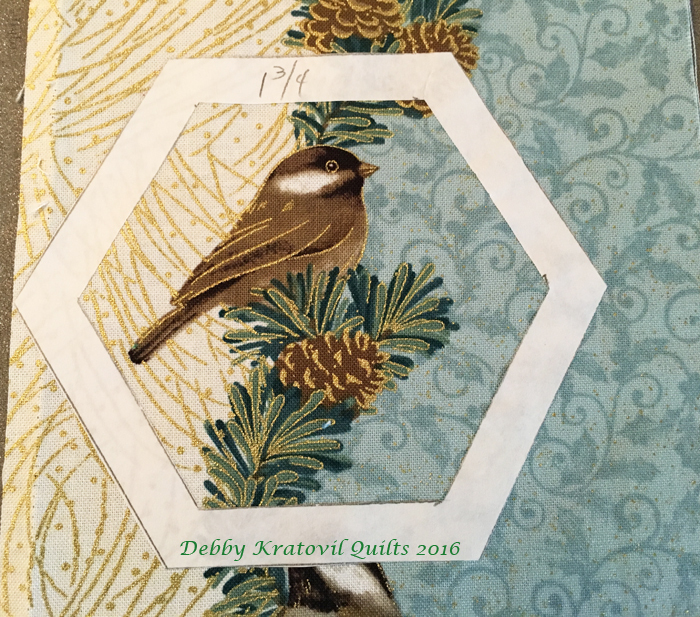 I have been busy with Festive Season by Jackie Robinson for Benartex. I have a blog post next week for Benartex (Technique Tuesday) featuring these fabrics, but these are just a few things I've made in the meantime. November 25 in the calendar was easy to rotary cut. Diamonds, jewels and triangles. My project next week features this in a fabulous project. That's all I'm saying right now! Jackie's fabrics have these awesome cardinals that begged me to fussy cut them to feature in the center of a block. 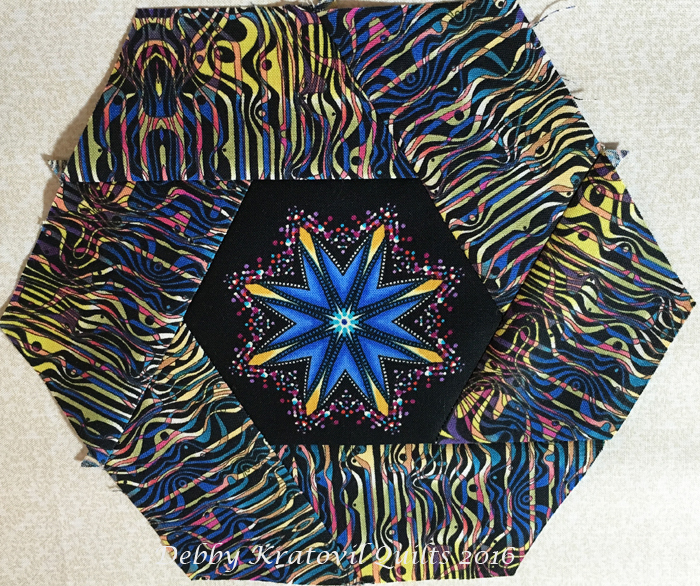 I call this Twisted Hexagon. 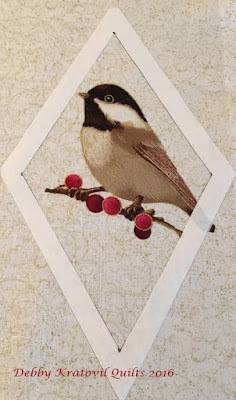 Let's see how I fussy cut another cardinal for a different block. Cut out a piece of freezer paper the size of needed patch; cut out paper center (leaving 1/2" of paper). 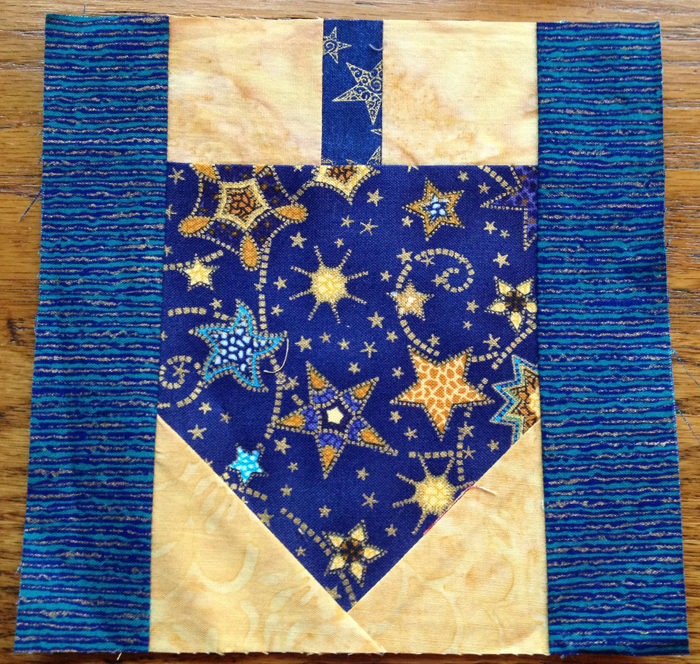 Centered the motif and ironed freezer paper to fabric (so it adheres). 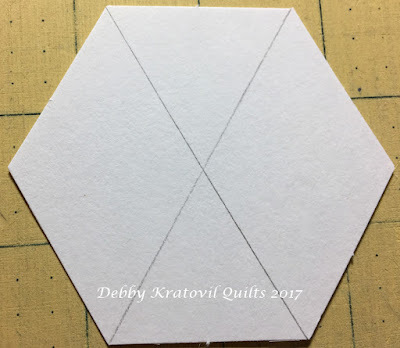 Peel off freezer paper (can be reused multiple times).Cut out hexagon shape and ready to stitch. I loved the November 19 block. I gave it a name: Christmas Star and Hexagons. All shapes were easily rotary cut. And there are no y-seams. And one more from November: the 27th. I shared this on Monday. 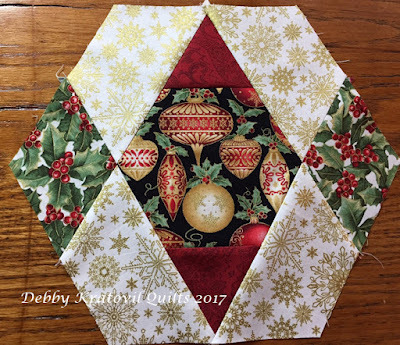 I got to showcase those awesome ornate ornaments in that center hexagon. Again - no y-seams and all rotary cut. 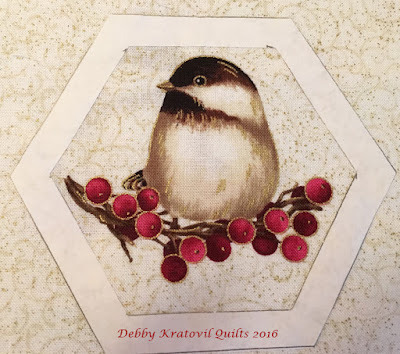 Last year I worked with a Benartex collection called My Little Chickadee. Let me show you a few blocks - using Katja's calendar and book - and the little birdies. 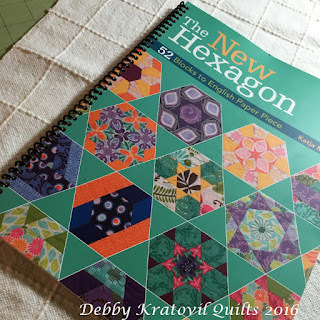 These are from Katja's book, The New Hexagon. These delightful little birdies begged me to fussy cut them. 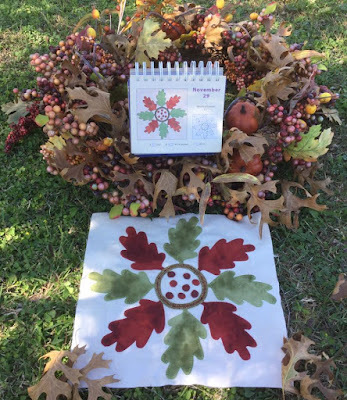 I used freezer paper as shown below. Unfortunately, he got a bit of his tail whacked off. Fussy cutting another little birdie. 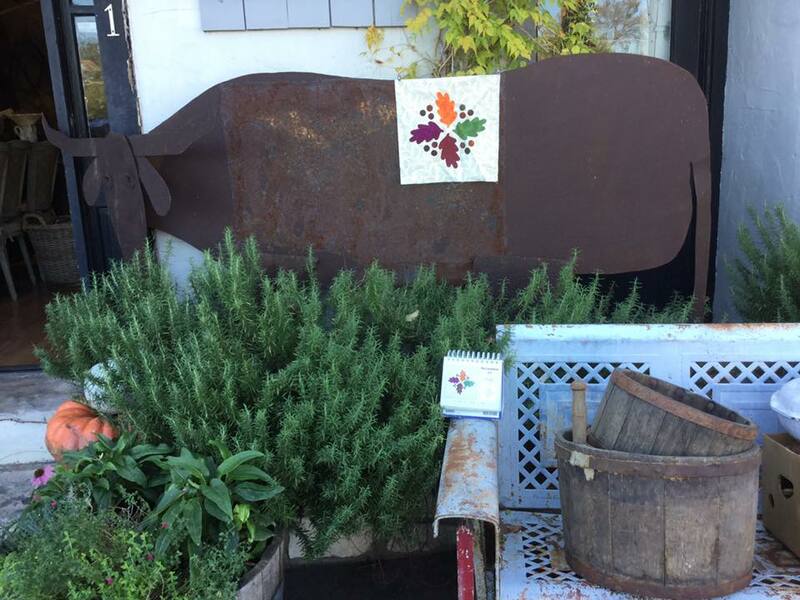 This was used in the Judy block above. Take a visit to Katja's author page at the Martingale web site: Katja Marek. You will see her book The New Hexagon - 52 Blocks to English Paper Piece (which I also own). 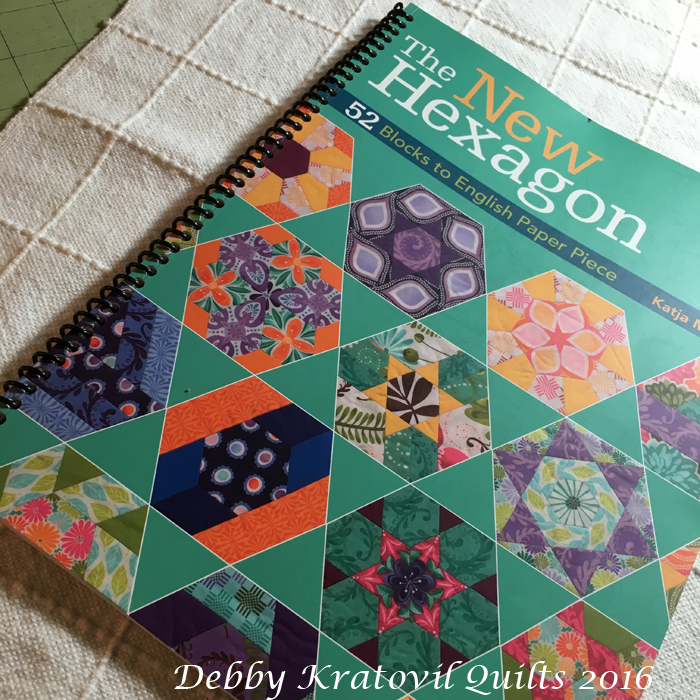 You can see my Pinterest Board with many of the blocks I've made so far using Katja's book, The New Hexagon. I've finished several of them and they are mug rugs and table mats. Go take a look! And her new Coloring Book and Dresden Plate book (also for English Paper Piecing). 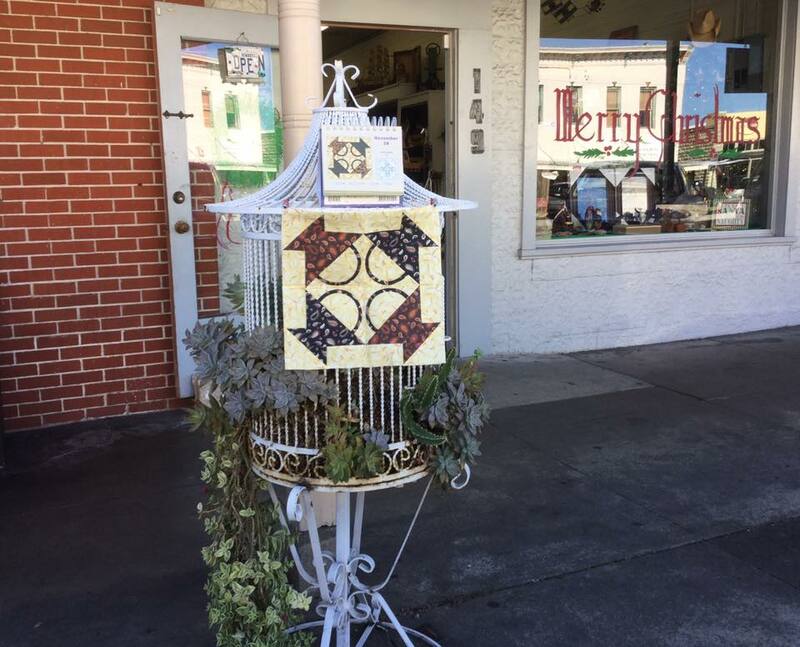 Hope you enjoyed seeing some beautiful fabric and some distinctively different quilt blocks. I love all things hexagon, and being able to rotary cut some gives me some quick ways to get to where I want to go. 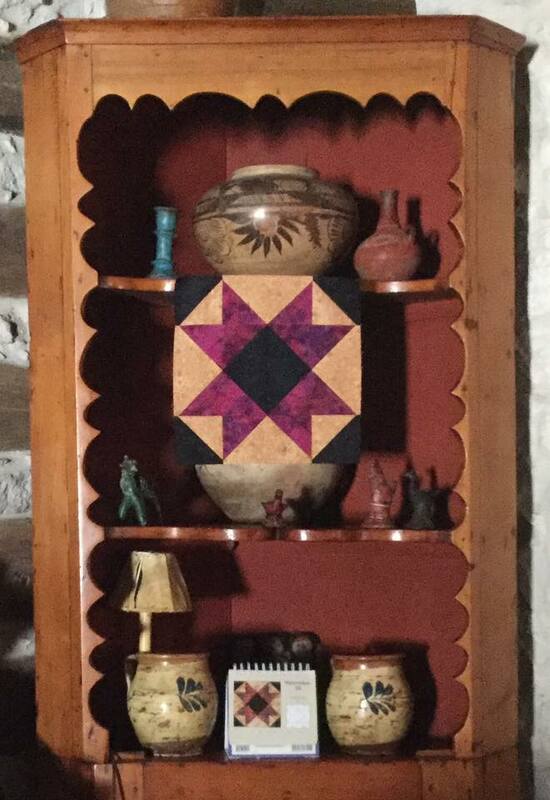 I will be back next Tuesday with a wonderful reveal of more blocks made into a terrific project. I gave these items to my oldest daughter as gifts for my 3 year old granddaughter's preschool teachers (last year). Eva goes to a Jewish preschool and I'm so glad these can make special gifts. I had 2 copies of the magazine and they were included, too! Let me show you some process shots and you can follow the link to the FREE paper pieced pattern. Then the body of the dreidel is added (I used an oversized square) and then it's trimmed for the last two triangles at the bottom. 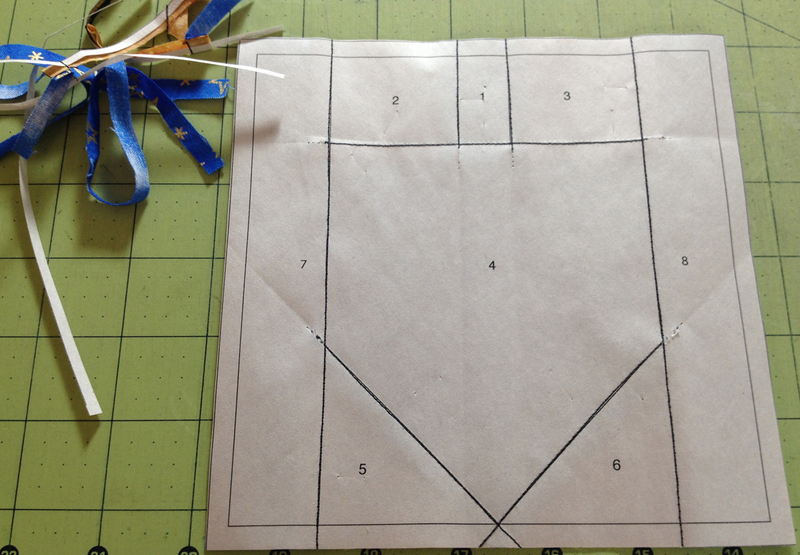 The two side rectangles added and then pattern trimmed from the back. And here's my block! 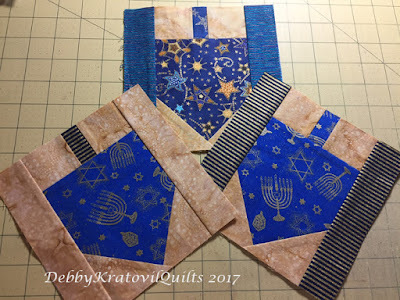 The FREE Dreidel pattern includes the patch size to cut (which are always oversized for paper piecing). So easy! I just discovered I still have THREE more of these blocks. 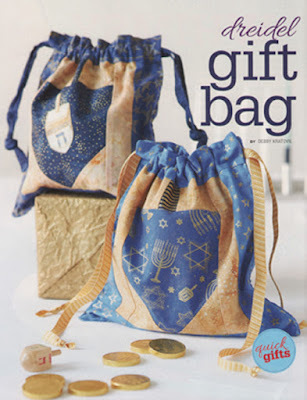 More gift bags! 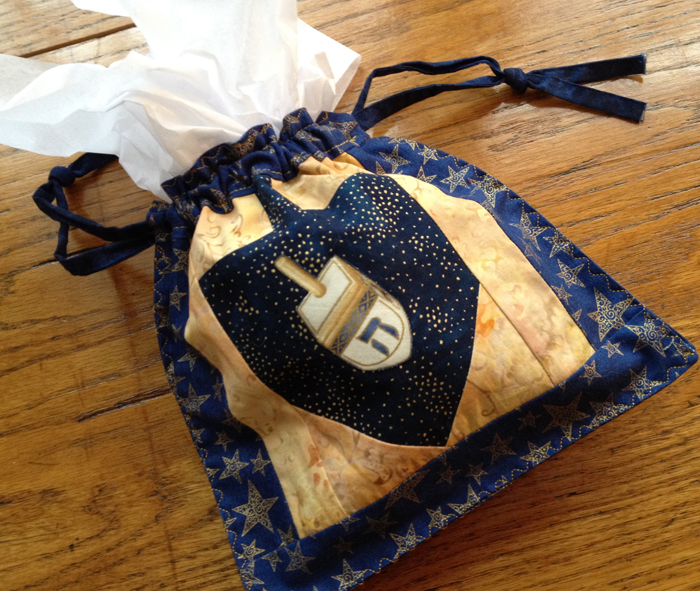 My Dreidel Block goes back 20 years when I first published it in Quilt Magazine. 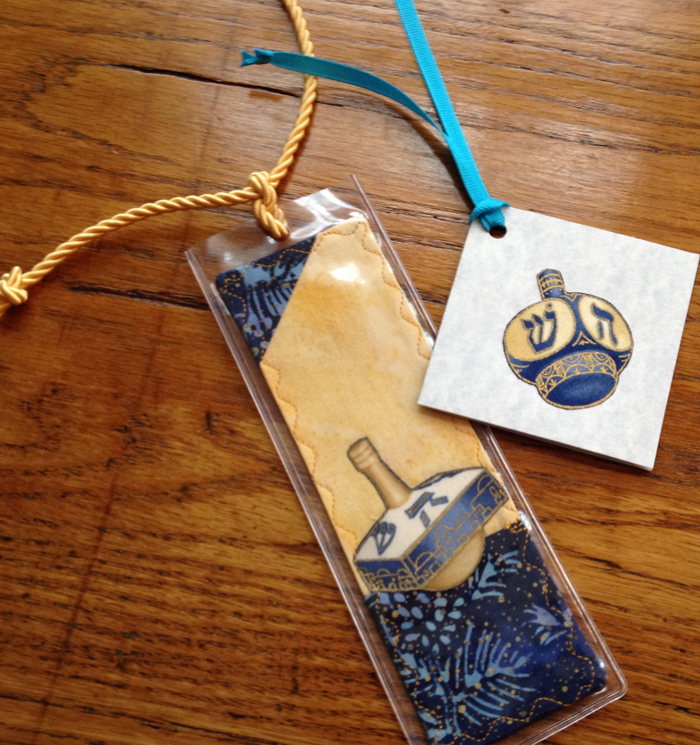 Hanukkah begins on December 16, December 12! 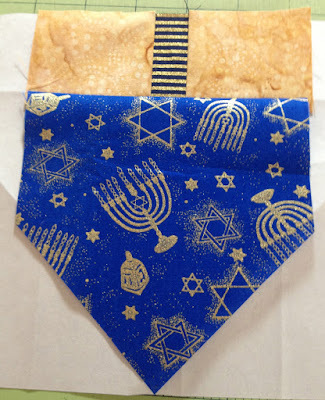 so you have plenty of time to whip up a few for your Jewish family and friends. I would love to see your blocks and any creative ways that you have used these - maybe even a small quilt or table runner? Peace, joy and blessings to my Jewish bloggers. And everyone else, too! "What the world needs now is love, sweet love", right? 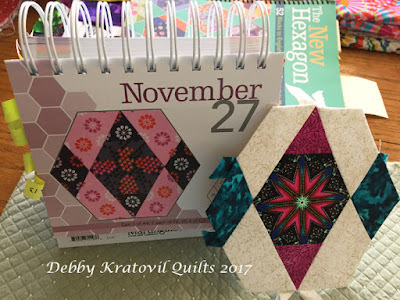 I have enjoyed making the occasional block using Katja Marek's book of 52 blocks (The New Hexagon for English Paper Piecing) and her perpetual calendar of 366 blocks. 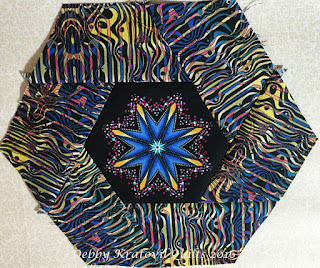 Sometimes, the renegade that I am, I rotary cut and sew by machine the various blocks. Why? Because I can! Today is November 27 and I saw that the block could easily be upsized and rotary cut. 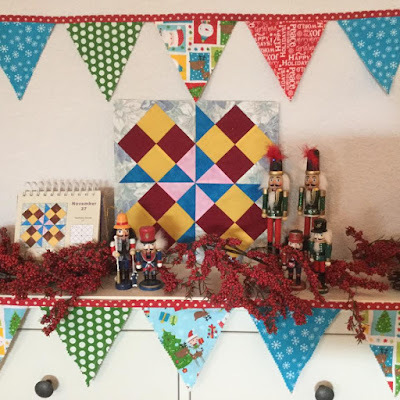 I used a new collection by Jackie Robinson called Festive Season and I love how it turned out. Don't you? 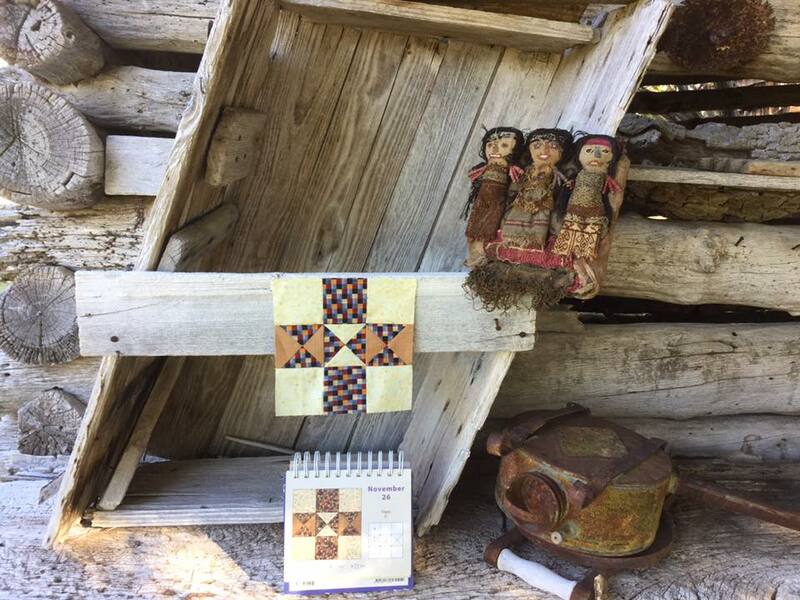 The blocks in the calendar are measured as is typical in EPP - the length of the side. They are a uniform 6" (so they can all fit together when placed block to block). 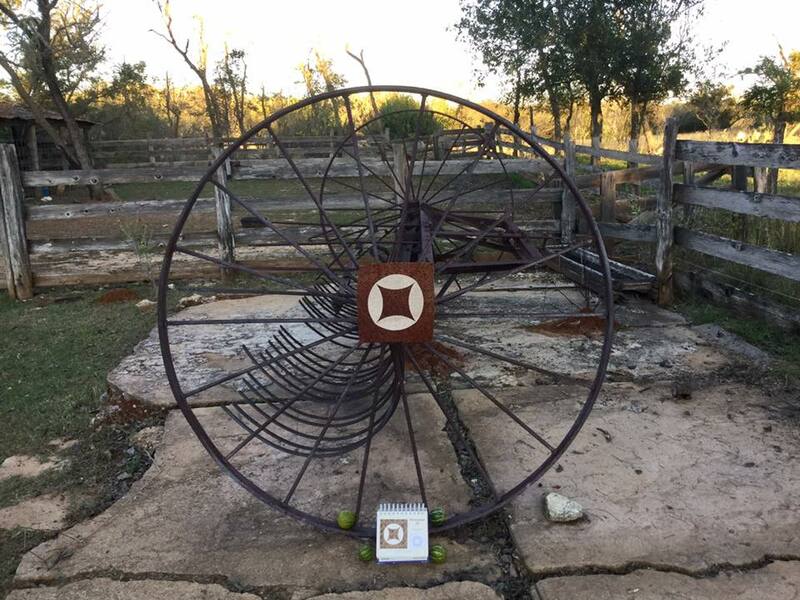 When rotary cutting, you measure the height of the finished patch and block. My block here will finish to 10". I decided to take the plunge and make this block with EPP. But I discovered I didn't have any patches the right size other than the 1-1/2" center hexagon. Or did I? Correction alert! 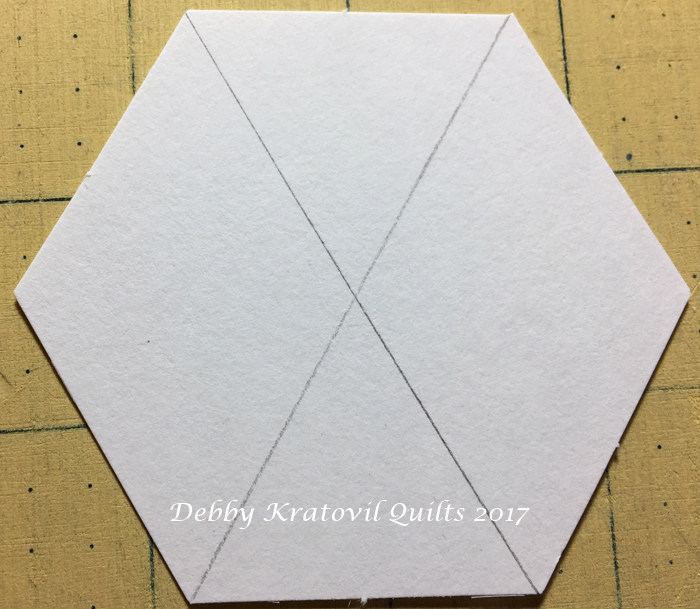 These patches are NOT cut from the 3" hexagon papers, but the 1-1/2"! A light bulb came on when I realized that I had some 3" 1-1/2" hexagon papers which could be cut to size for the diamonds, half-hexagons and small triangles. You don't believe me? Ha! Let me prove it. 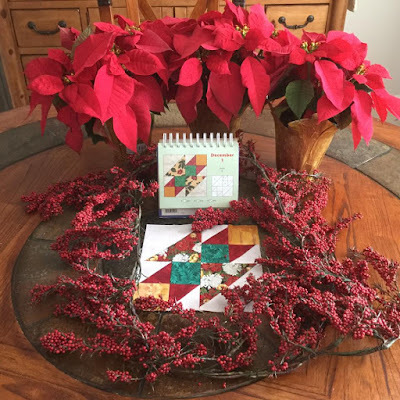 The templates for all the blocks are in the back of the calendar. My theory proved correct! The half-hexagons can be cut from the 3" 1-1/2"whole hexagon (see below). 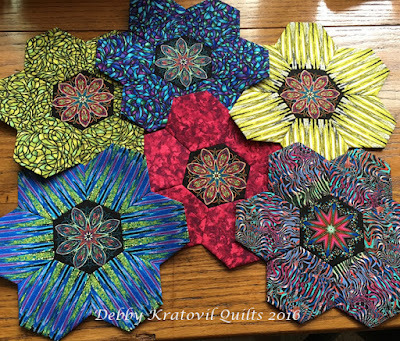 I cut two hexagons for the four needed half-hexies. Six triangles the size I needed can be cut from the same 1-1/2" hexagon, but since I only needed two, I drew the lines as shown below: yield, two triangles and two (of the four) diamonds. And my last 3 diamonds (I only need two) are cut from the hexagon as shown. 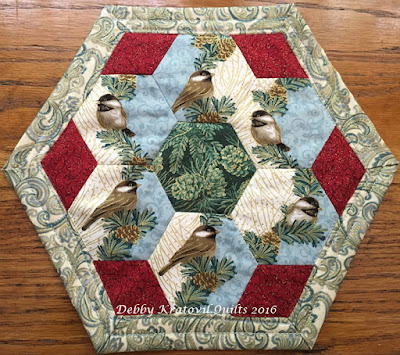 I already had a center hexagon pieced using a Paula Nadelstern motif. It used a - wait for it! 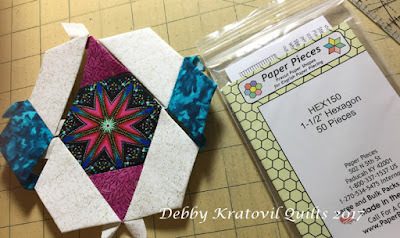 a 1-1/2" hexagon - exactly what I needed! 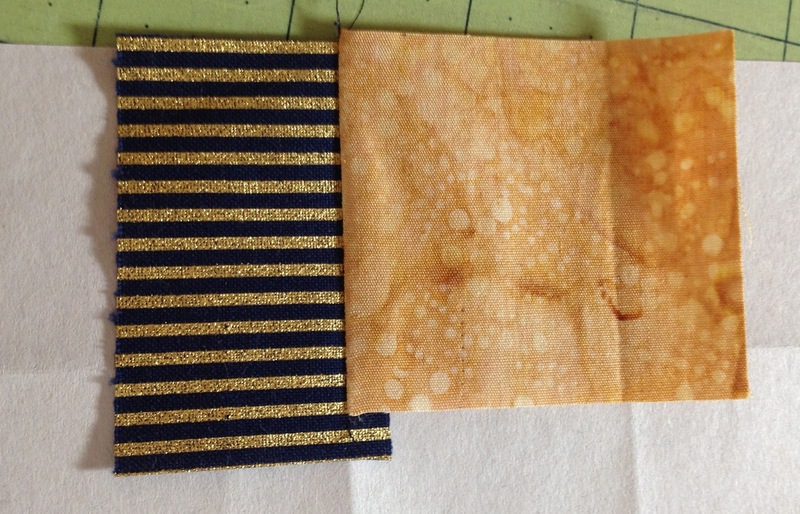 And can you see all of the card stock patches I cut from those simple 1-1/2" hexagons above? This was my lucky day! Now, I'm not one to cut my own papers. 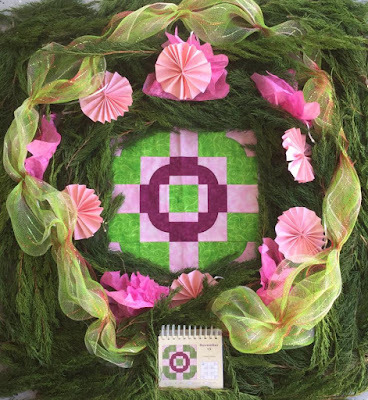 But this was easy because I had the pack of 1-1/2" hexagons from Paper Pieces. I have been using their papers for almost 20 years and I buy NO OTHERS. They are accurate and affordable and I buy them by the thousands for my EPP students in my workshops. 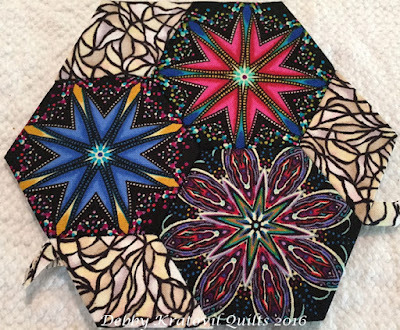 Stitch all of the individual units (1 hexagon, two red triangles, two blue diamonds and 4 cream half hexagons). I loved using my glue stick to keep this going quick! 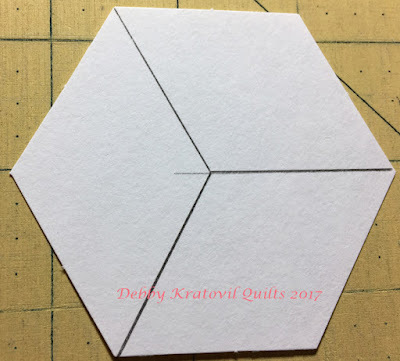 Join a blue diamond to a cream half-hexagon as shown, twice. These are added last, at the top, with a straight seam! 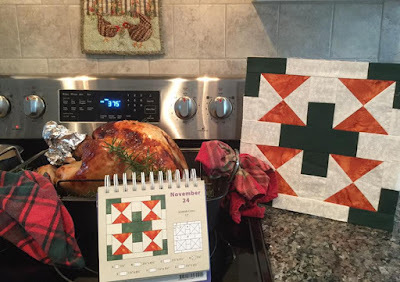 November 27 EPP block finished. Hope you enjoyed my process. 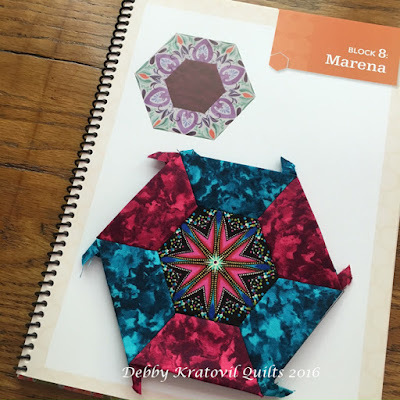 I have made several other blocks from Katja's book and calendar using this Paula Nadelstern collection. 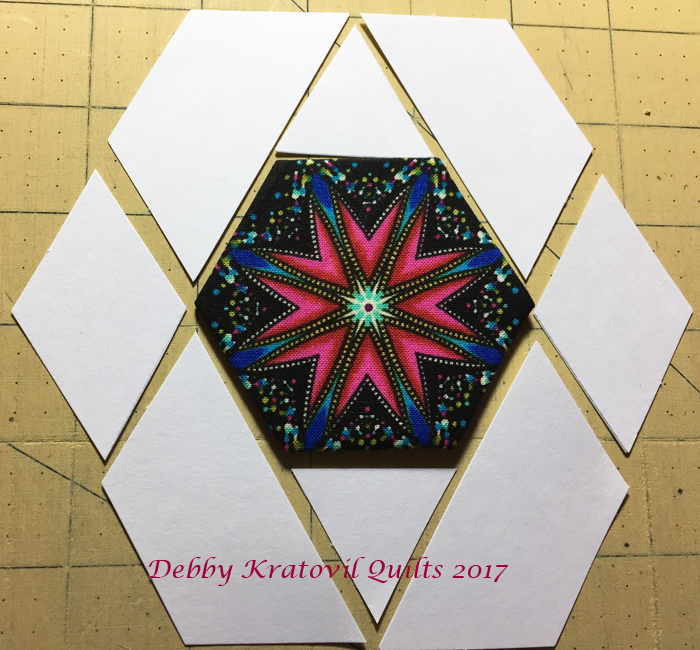 There are such awesome kaleidoscope motifs that are perfect for those center units. And, finally, some regular Grandmother's Flower Garden blocks. 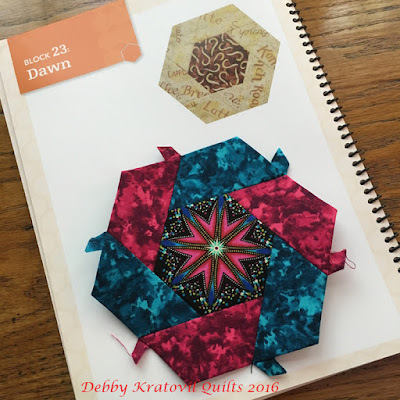 I love these and hope to make them into an awesome quilt sometime soon. I think these use 2" hexies. Doesn't matter - they all are the same size! So, you see I've been busy. Someday, I'll put them together into something. 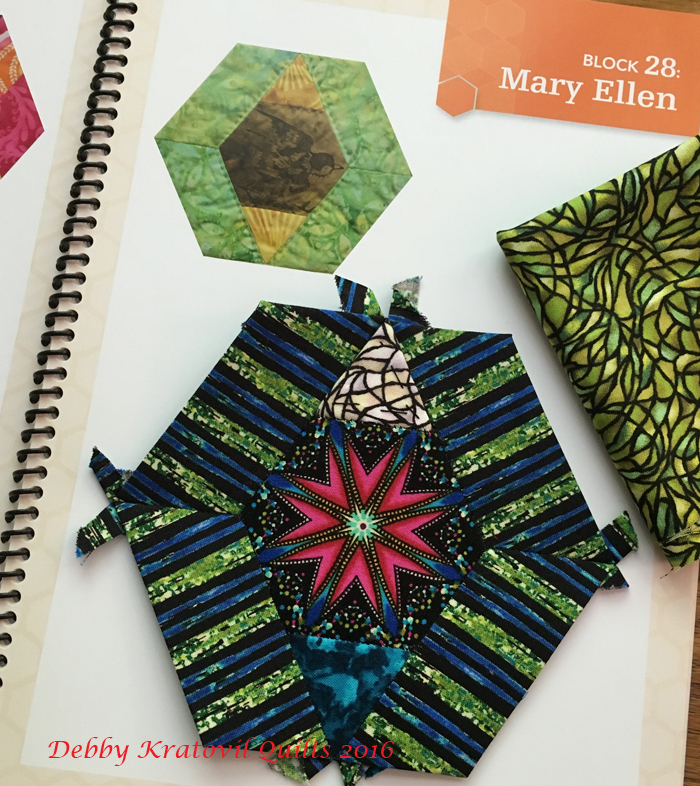 For now, they are happy to be hanging out with all the other blocks in my EPP drawers! I'll be back another day this week with some more blocks and ideas. Let's open up the magic box and see what Patricia has for us this week. Seven new blocks, one for each day of the week. 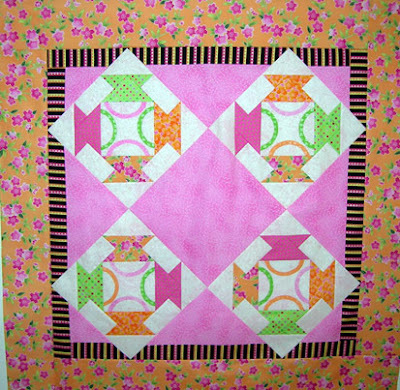 November 28: Stamp Basket, 12"
I have at least one quilt made using the Stamp Basket block. This one was made about 15 years ago using a bright and happy fabric collection in much larger blocks. November 29: Wreath of Leaves, 12"
A little back story on the November 30 block. My son in law, Daniel, is from Spain and this is his birthday! There are a lot of beautiful castles in Spain. So glad you stopped by this week. 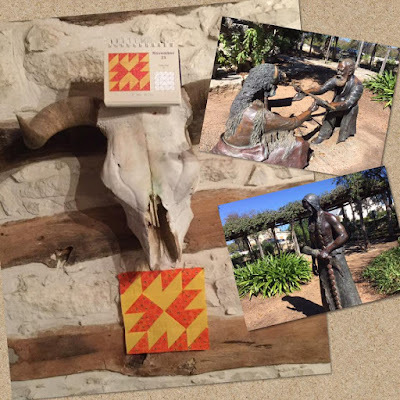 Hope you enjoyed seeing 7 more of these beautiful blocks from Patricia Bryant of Australia! New week, new set of 7 beautiful blocks. November 19: Savannah Squares, 15"
November 20: Blackford's Beauty, 16"
November 23: Indian Trails, 8"
November 24: Scottish Cross, 12"
November 25: Teardrop Melons, 9"
Have a wonderful week. 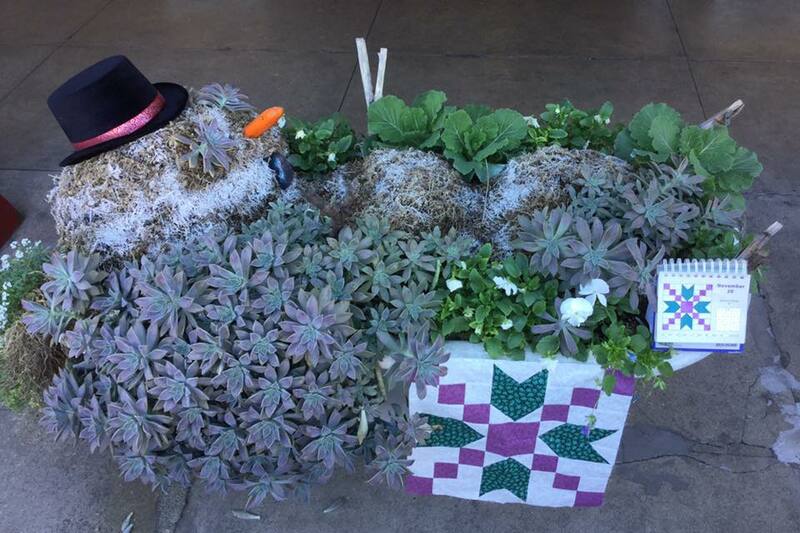 Don't eat too much on Thursday and don't spend too much on Black Friday! See you next week! 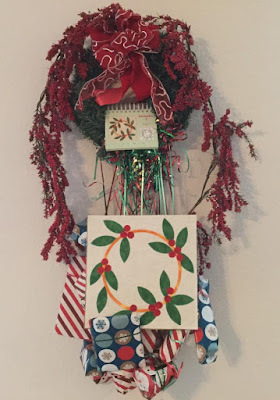 More Scrap Busting Tissue Holders!